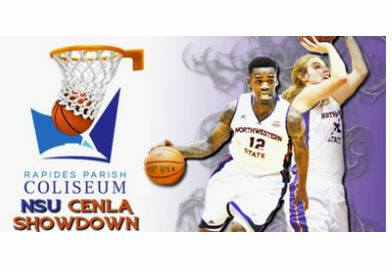 Central Louisiana’s premiere major event venue, the recently-renovated Rapides Parish Coliseum, is the site for the Saturday, Dec. 9 Cenla Showdown featuring games involving Northwestern State’s highly-successful NCAA Division I men’s and women’s basketball teams. The Lady Demons tip off the afternoon doubleheader against reigning Southwestern Athletic Conference champion Texas Southern at 2 o’clock. 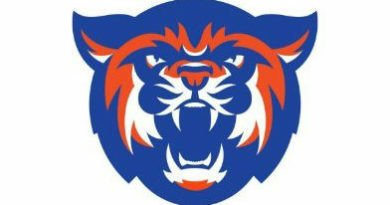 The second game, at 4, pits the high-scoring Demons against their long-time rivals, the Louisiana College Wildcats. Greg Burke, the veteran NSU director of athletics, led an NSU Athletics staff delegation that visited the venue earlier this month. On Monday, Burke, associate AD Dr. Haley Taitano and other university personnel met with members of the Alexandria-Pineville business community and NSU alumni at a luncheon to discuss launching the Cenla Showdown. “Playing at the renovated Rapides Parish Coliseum is a great opportunity for our basketball teams to compete in an outstanding facility and bring Division I basketball to the Alexandria-Pineville market and surrounding fans,” he said. “This doubleheader also provides an opportunity for NSU to enhance its presence in Central Louisiana, where it has a strong alumni base, a Cenla campus in Alexandria, and a high profile with local media. Our plans are to make this an event, not just a basketball game,” said Burke, who is a member of the Central Louisiana Community Foundation Board of Directors. Additional promotional elements will be announced in the coming weeks, he said. General admission tickets are $10 and a limited number of special floor-level, courtside reserved are $15, said NSU assistant athletic director for ticket operations Mike Jacklich. High school and college students with a valid ID can purchase $5 tickets. Purchases can be made online at face value through NSUTickets.com, and also at Ticketmaster.com, with a transaction fee involved, said Jacklich. Tickets are also on sale in advance, at face value, at Rapides Parish Coliseum’s ticket office. The Demons are aiming at their fifth postseason tournament appearance, and fourth trip to the NCAA Tournament, under 19th-year coach Mike McConathy. The Demons have ranked among major college basketball’s highest scoring teams in three of the last five seasons, leading the country in 2012-13. A roster including eight newcomers is built around talented veterans Ishmael Lane, Devonte Hall and Iziahiah Sweeney, and the returning record-setter, point guard Jalan West. The Lady Demons have made three postseason tournaments in the past four seasons, including NCAA Tournament berths in 2014 and 2015. Second-year head coach Jordan Dupuy sped up the pace of play in his first season and plans to increase tempo in 2017-18. A pair of junior college transfers – guard Nautica Grant and forward Leah Barnes – join a nucleus of senior Tia Youngblood and juniors Cheyenne Brown and Libba Gilliam on Dupuy’s second Lady Demons squad as NSU eyes its sixth straight trip to the Southland Conference Tournament. Louisiana College and NSU have met in men’s basketball for more than a century, dating back to the 1914-15 season, as fans have enjoyed traveling between Natchitoches and Pineville. This meeting will be the 155th contest between the Wildcats and Demons, and is believed to be the first off-campus collision. The Rapides Parish Coliseum opened earlier this year after $23.5 million in renovations to a facility constructed in 1964. It was home for state high school basketball championships for more than two decades from the 1960s to the 1980s. The LC Cats are Back in Action at the Coliseum! January 24, 2018 KLAX TV, ABC 31 Comments Off on The LC Cats are Back in Action at the Coliseum!